We are incredibly excited to share that we will be one of the featured artists at LibertyTown Arts for the month of September! 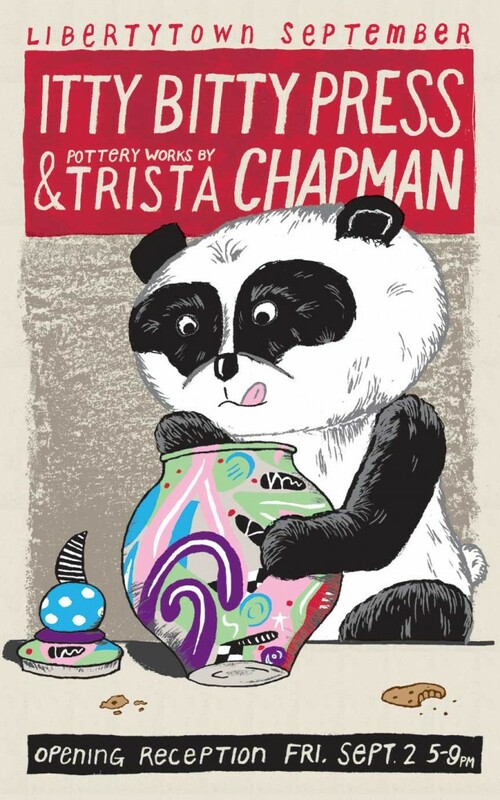 Our posters and prints will adorn the walls, while the whimsical pottery of Trista Chapman of Sophia Street Studios will brighten the shelves. We created the image to the right to advertise for the show. This will hang outside LibertyTown as an 8’x5′ banner (huge! ), and we also plan to make little frameworthy handbills that we’ll put in a few places around town. Among the many things we have in progress right now is a brand new print series that will be unveiled for the first time at the show. If that’s not incentive enough to visit downtown Fredericksburg on First Friday, we’re ALSO going to do a limited edition screen print ON SITE at the opening. If you’ve ever wondered how the screen printing process works, this will be a great opportunity to see it in action. Next post: Double your fun!